Comedian Amy Schumer is about to give birth to her first child with hubby Chris Fischer, but her pregnancy has been plagued with the severe illness hyperemesis gravidarum (HG). It’s the same awful condition that Duchess Kate suffered from during all of her pregnancies and for Amy, it meant throwing up pretty much every day of her pregnancy. “Since the comedian Amy Schumer became pregnant, she had vomited, in her conservative estimate, 980 times,” The New York Times reported last month – and honestly it sounds blinking horrendous. Fans have been sending their love to the mum-to-be as she’s been forced to cancel shows, spend a lot of time with her head in a bucket and even spend time in hospital being treated for dehydration and nausea. It’s not surprising that her fans perked up when they saw this week’s baby update from Amy. It’s a photo of her in her undies, belly brilliantly blooming. But it’s more the caption that has everyone relieved. “Feeling strong and beautiful today #didntpuke,” Amy posted. You get the feeling fans are not the only ones happy with this respite from vomiting. Amy must be elated to get a little bit of time off from feeling horrible. It wasn’t just fans who loved seeing Amy feeling so much better (even if it’s just for a short while!) Celebrities were willing her on too. “You are ✌🏼✌🏼✌🏼🙏🏿🙏🏿🙏🏿”, actor Rosanna Arquette posted. “Get it mawma!” Snooki wrote. There were others too with Celeste Barber, Ali Wong, Debra Messing, Krysten Ritter, Sarah Paulson and Cat Power all rallying in the comments of this photo. 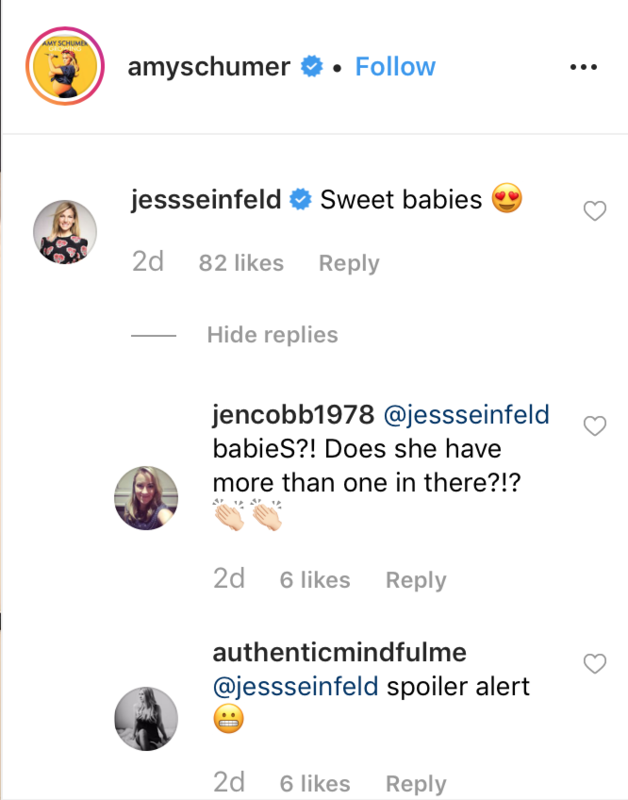 And let’s not ignore the fact that Jessica Seinfeld commented: “Sweet babies 😍” and suddenly everyone decided Amy was having twins. WHUT?